For this reading group, we will independently read through the designated sections and come prepared to discuss our learnings and challenges. ​Pre-registration required by Feb 25! Join somatic movement educators Abbi Jaffe and Amanda Franz for a lightly facilitated book group; conversations and somatic practices inspired by the book My Grandmother’s Hands: Racialized Trauma and the Pathway to Mending our Hearts and Bodies by Resmaa Menakem, MSW, LICSW, SEP.
“The first self-help book to examine white-body supremacy in America from the perspective of trauma and body-centered psychology. The body is where our instincts reside and where we fight, flee, or freeze. 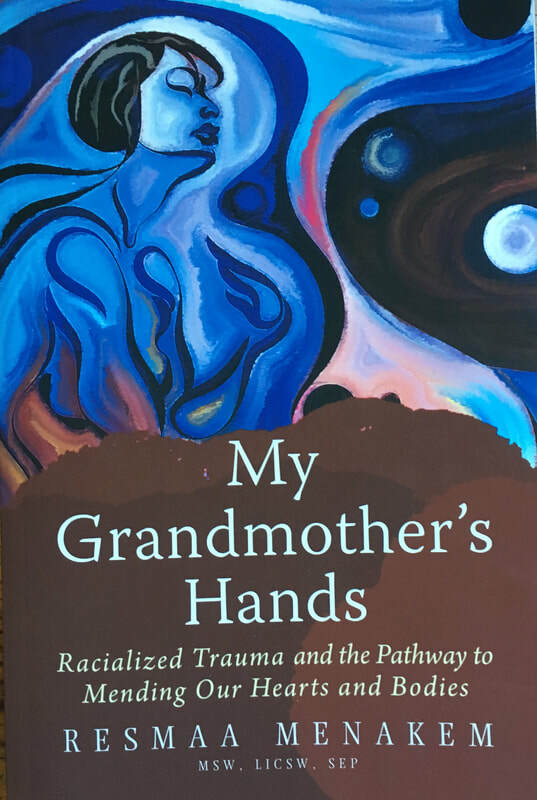 My Grandmother’s Hands is a call to action for Americans to recognize that racism is not only about the head, but also about the body. Menakem introduces an alternate view of what we can do to grow beyond our entrenched racialized divide and takes readers through a step-by-step healing process based on the latest neuroscience and somatic healing practices. " Pre-registration required by Feb 25 HERE. Purchase your book, then read Section 1 for Feb 27, 2019.
as a Cultural Somatics consultant for the Minneapolis Police Department. he managed the wellness and counseling services for civilians on fifty-three US military bases in Afghanistan. He currently teaches workshops on Cultural Somatics for audiences of African Americans, European Americans, and police officers. ~ Tim Wise​, best – selling author of ​White Like Me: Reflections on Race from a Privileged Son and Dear White America: Letter to a New Minority.